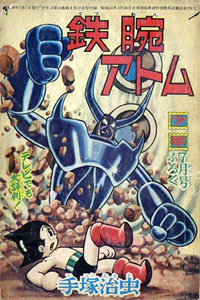 Astro Boy, it is safe to say, enjoyed an impressive reception on being first published in 1952. The healthy, upright, valiant, and plucky character of Astro Boy managed not only to win the hearts of young readers, but also changed many adults’ perceptions of comic books, and appealed to audiences both young and old. Even if you have never heard of Osamu Tezuka, you must have heard of the name Astro Boy. As for the more manga-savvy crowd, what does the name Osamu Tezuka mean to them? In one word: God. His fans revere him as a "Comic God", which goes to show that throughout Japan's comic book industry his lifetime contribution to the medium is widely recognised. The Second World War, and the ensuing years of poverty, reduced comics to be regarded somewhat as an extravagance in the eyes of many, as people's need for material goods far outweighed the need for spiritual or mental outlets. It was Tezuka, back then, who propped up the barren sky of manga for his key predecessors. It is because of their efforts that we have now and in the future countless readers and writers whose lives have been touched by comic books - because of them our generation enjoys an inexhaustible supply of manga and anime resources. Osamu Tezuka has undoubtedly done the most for manga and has been the most prolific of his generation of manga writers. Astro Boy demonstrates a successful fusion of imagination and commercial appeal and in the same way some of his other far-reaching masterpieces such as Phoenix, Adolf, Ode to Kirihito, and Buddha have survived the test of time. Such accomplishments stand as proof not only of how much he loves comic books, but also of his attempt to make comic books a medium that appeals to all generations. Tezuka is a man who has managed to both live in a dream, and yet not forget to communicate some precious content for future generations of people. In comparison to Astro Boy's friendly and non-threatening character, Black Jack, who appeared on the scene in 1973, carries some of Tezuka's more cynical thoughts. With Black Jack, Tezuka, who was officially a doctor, not only vividly brings out his specialist knowledge, but also also uses daring and innovative ideas to explore solutions to difficult medical cases. What is more, he purposefully created the superhuman doctor character to have a cold outside but warm interior, just like the scalpel he carries in his hand, sharp but benevolent. The series exposes many of the hypocrisies of human nature and portrays the seemingly healthy modern day society as a malignant tumor. Although Black Jack was serialised in publications aimed at younger audiences, the values and subject matter were never restricted in any way. Tezuka, with the successes of Black Jack and Astro Boy under his belt, is undeniably worthy of best-seller status, having sold over 100 million and taken the world. Doraemon, another title that took the world by storm and managed to be even more influential than both Astro Boy and Black Jack, has become a household name. Even now, long after creators Fujio and Fujiko have passed away, their legacy of timeless classics still earns them the adoration of worshipping fans. Doraemon is every child's greatest companion; a blue guardian angel protecting us behind the scenes all our lives. All that he is and means, is beyond words. Comic book fans born after the 1980s shouldn't be unfamiliar with the explosion of manga of that period, which was a laudable springtime of comic books and animation. Japanese comic books were already the talking point of both domestic and overseas entertainment; Saint Seiya, Captain Tsubasa, Dr. Slump, Ranma1/2, JoJo's Bizarre Adventure, City Hunter... no matter which title you pick, all of them were then and still are widely known classics. Of these, the greatest was Dragonball, which was a phenomenal success for creator Akira Toriyama, coming out on top of Hong Kong's most popular comic book league table back in 1993. Over forty volumes, readers grow up with Sun Wukong, following his journey from being a tailed child haunting the mountain wilderness to an intergalactic warrior roaming the universe. 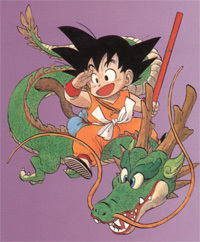 At the same time, readers are tossed around and enraptured by Toriyama's imagination, an imagination where anything goes. Even if you get away from Southeast Asia, Dragonball enjoys a huge and enthusiastic following across the Pacific. If we come forward 20 years to now, we see that Dragonball has legitimately landed in China and has been calmly subduing the current generation of Chinese children. The impact of Dragonball is on a world scale and has undoubtedly significantly influenced current celebrated action-packed titles such as Bleach and Naruto. Dependent on the rich influence of his writing and his ever improving technique, Takehiko Inoue has always been adept at making his readers surrender to his stories. Slam Dunk is just like a door that leads into a new world, inspiring countless young people to dream of basketball stardom. 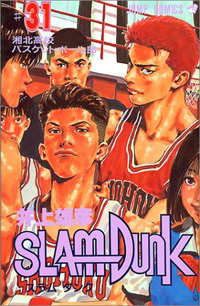 At the time of its first publication, 1990, basketball wasn't the typical subject matter of manga as black ink on white pages doesn't easily lend itself to conjuring the excitement and fury of sporting situations. The artists, who were even greater basketball fanatics than Inoue himself, trampled such technical obstacles to deliver many incredible and evocative images. Hanamichi Sakuragi, Kaede Rukawa, Hisashi Mitsui, Sendoh... are just some of the names that have become for many strong symbols of masculinity! After Slam Dunk, Inoue has still been turning out works such as REAL and Vagabond, both of which are, like Slam Dunk, ongoing series. The quality of these series depends on keeping readers on tenterhooks, eagerly awaiting new and exciting story arcs and artwork. It would not be an exaggeration to say that Takehiko Inoue is the most innovative and promising talents to have emerged from that era of manga history. You can't talk about sports in manga without discussing Japan's national sport: baseball. Strictly speaking, the appeal of Mitsuru Adachi's baseball comic Touch isn't exclusively based on its popular sports subject matter as he further engages his readers by saturating the story with themes of youth and first love. The theme of growing up is a prominent element in Touch as, over the course of its 26 volumes, Adachi's sense of humour, attention to detail, sentiment, enthusiasm, and warmth bring to light our ideas of youth and adolescence. After Touch, Adachi produced another classic, H2, which again combines youth and baseball and touches on ideas of the intertwined destinies of men and women deftly, further revealing Adachi to be a writer of substantial talent. Looking broadly at Adachi and other writers in manga, it could be said the attention given to the heyday of youth is universal. In Japan's manga circles, Mitsuri Adachi is a timeless poet of youth, and "Touch" was the first of his works to be a "100 million copies" bestseller. Fist of the North Star, a fighting-based series created by the senior screenwriter, Buronson and the hardline illustrator, Tetsuo Hara, enjoys the popularity of a "100 million copies" bestselling series. Interestingly, Fist of the North star's fanbase is by and large male. This is because the majority of fight scenes in the series are rough close-quarter dogfights, and aside from the visuals, the drama is also very masculine. Fist of the North Star, in the same way as the above mentioned manga classics, gained greater popularity as soon as it crossed over to animation. Even many years after the series finished, Fist of the Blue Sky was presented as a follow-up series. Typically, the popularity of a comic book depends on what is going on at the time it first emerges on the scene. Different times have different readers, as tastes and trends change. If the classics of the past appeared on the scene for the first time in the present day, it’s a possibility they would go unrecognized. Naturally, there are some titles that would make waves irrespective of when they first came out, and even if they couldn't match the large amount of sales that titles enjoyed in the past, they would still quickly come to forefront of the industry. Detective Conan and One Piece are in this way the new stars of manga. 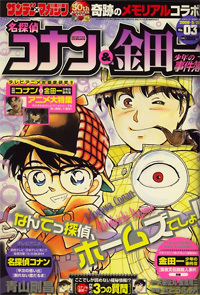 The success of story of Detective Conan, the most popular detective comic of all time, is undoubtedly due to Gosho Aoyama's ingenious deployment of cutting edge ideas, as well as the inclusion of not only experimental and uninhibited approaches, but also visually striking male and female characters to appeal to different readers tastes. The series boasts a rich cast of characters who drive the story, with handsome high school detective Jimmy Kudo and extraordinarily agile female karate expert Rachel Moore as the cute members of the young detectives; the mysterious and elusive Phantom Thief Kid; Harley Hartwell, the enthusiastic young guy from Osaka; the hilarious and bizarre father, Richard Moore; and the master of all manner of strange inventions, Dr. Herschel Agasa. Furthermore, the many tense and turbulent story arcs involving the Black Organisation, and the range of cases solved in every episode, ensures that even after 60 volumes Detective Conan is going from strength to strength. The franchise doesn't stop at comics either, with an epic, long-running TV series, annual stage versions and even a Detective Conan market located by the Edo River. After Fujiko Fujio, Detective Conan has become another phenomenal best-seller. Eiichiro Oda's One Piece is one of those rare works that bursts with vitality. Out since 1997, within ten years it had already scaled the "100 million copies" best-seller list, an astonishing feat for a relatively "young" title, but just like its elastic-limbed protagonist, Monkeyl D. Luffy, its reach knows no bounds. Although the series is already approaching its 50th volume, the story ideas that have already been used in the series are a drop in the ocean of the things to come. Oda seems to have a great belief in the developments of the future, leisurely broadening the horizons of the character's sea-faring. With a writer who keeps his cards to his chest, One Piece is deservedly the most gripping manga for young people currently in circulation. A comic's overall sales volume can be huge. Aside from other potentially complex reasons worth looking into, it's possible this is because there are so many volumes. Examples of this kind of series are Takao Saito's Golgo 13, Tetsu Kariya and Akira Hanasaki's Oishinbo, and Osamu Akimoto's Kochikame. They have all been in circulation for two or three decades, with over 100 volumes each, and are still going with no sign of coming to an end any time soon. Some people might see this as a rather laboured approach to story-telling, but on the contrary, such a long comic lifespan can function to set up an elaborate and extensive background which gives all the information and drama in the story's development a certain weight. Take Golgo 13; through the point of view of the protagonist, a hitman by the name of Golgo, we are introduced to the development trends in the modern world, with the story incorporating politics and currents events into tense storylines, which provides a fascinating insight into the world over years. The same goes for Kochikama; hailed as the 'comic for Japan's everyman', the series has always reflected the changing life and culture of Japan over the years, and therefore has always had a constant reservoir of ideas, serving as an encyclopedia of contemporary Japanese society. If Kochikame is the encyclopedia of Japanese society, then Japan's longest running culinary themed series, Oishinbo, with its all-embracing attitude to cuisine from every country and region of the world, is the rich, detailed, and never dull super-cookbook. Each one of these three titles has resonant lessons for their readers, and it is fair to say their length is justifiable. ...and that's it. The 20 bestselling titles listed on Japan's Wikipedia have all been introduced. Regardless of how they earned the prestige they enjoy nowadays, each one of these titles has sold over 100 million copies and it is quite clear their perceived "quality" has fundamentally been determined by their "quantity" of sales. Nowadays, with an ever more burgeoning comic book industry, popular titles that follow in the great striding footsteps of the older generations of comic book writers and artists keep emerging, and as time goes on, many more spectacular works will enjoy the honor of a place on the great line of comic book classics. Submitted by Anonymous (not verified) on Fri, 2008-11-21 21:20. Submitted by santi chuco (not verified) on Fri, 2009-01-23 15:07. One Piece fue el manga las vendido del 2008. Saludos a Mexico, Peru, Colombia. Submitted by GaShinShouTan (not verified) on Wed, 2009-04-01 14:27.
realy fun to read it , i hope you translate others like this ^^ . Submitted by Dikkat Oyun (not verified) on Thu, 2009-05-14 10:55.